AFOLCON is a 1 day fan convention, it is the UK's first and only LEGO convention dedicated to adult fans. Attendees will be able to listen to guest speakers, including those employed in the LEGO company as designers. 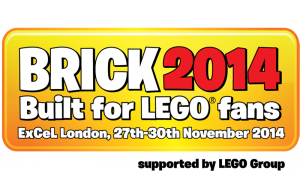 BRICK 2014 is a 4 day public show with support from The LEGO Group. Like most LEGO shows, BRICK 2014 will feature models from both fans and professional builders. Representing at AFOLCON is the perfect opportunity to promote LEGO Stack Exchange. AFOLCON has an audience of mature LEGO enthusiasts, many of whom are already active and familiar with online communities but may not be aware of LEGO.SE. The goal of visiting this convention is to raise awareness of our community and promote the Stack Exchange Q&A model. If you're interested in promoting LEGO.SE this year at BRICK 2014 and/or AFOLCON please read this Meta topic and tell us why you should represent LEGO Stack Exchange. Are you an active, engaged member of the community? Have you organized the community around events like contests or important meta posts in the past? Do you leave guiding comments on newbies’ posts with great regularity? Have you attended an event before and told everyone far and wide about Stack Exchange and its awesomeness? Have you been sponsored by us before? The more you can show us that you’re a deeply committed user and an engaged member of the community, the better your chances of approval. I have supported LEGO Stack Exchange since its infancy at Area 51. As a pro-tem moderator of the site for over two and a half years, I have become very familiar with how Stack Exchange works and I feel comfortable explaining to other LEGO fans what LEGO SE can do for them. I would like to be able to bring the site to the attention of a wider audience. To do so, I plan on working closely with the Stack Exchange community managers to develop suitable promotional material (such as t-shirts, pamphlets or business cards). I plan on producing a daily photo report of my experiences which I will share with the LEGO.SE community as Meta/Blog posts. I'm familiar with London having lived there and visited many times. By Rail and DLR I can get to ExCel London in 1 hour and 20 minutes from my nearest train station.